Can provide many more photos if interested! Also happy to provide exact measurements if you are interested. Super comfortable and flattering dress. Beaded, but not heavy at all. This dress was worn once, was professionally dry cleaned and is in excellent shape. I also have a tulle cathedral length veil and some extra lace fabric (the same lace on the dress) that I would be happy to include. Off-white lace overlay with rosegold satin fabric liner. 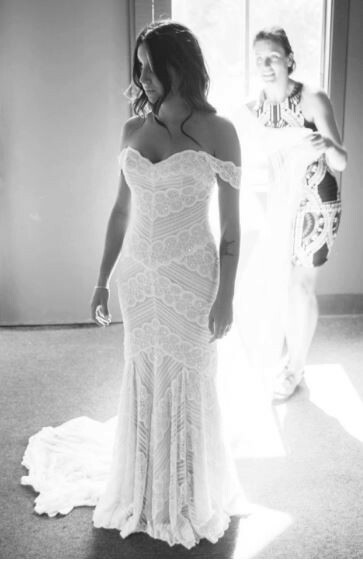 Beaded circle lace on the entire dress. Stretch satin liner. Chapel length train. Cathedral length veil. Closed button closures down the back. Has boning. Has removable straps (with hidden hook and eye clasp) that can be worn either draped off-shoulder (as pictured) or pulled up like regular straps or just wear strapless. Neckline altered and made more of a sweetheart shape. Slight alterations to cinch waist and make more form fitting. Removable straps added. Length was not altered at all.